I believe learning is a lifelong activity with many opportunities to take advantage of. Experiential learning is the basis of learning through the reflection of doing. This type of learning is effective in all types of situations whether it be in school, at work, or in life. In response to being tasked with creating programs that would utilize the newly added ropes courses activities where I work at Utah Olympic, I set out to learn more about ropes course and team building initiatives. I had just finished my year-long program with Leadership Park City in 2013, so I had a good idea of what a team building program might look like, but I did not have enough information to put together a robust program for our organization. I was sent to Boston in the fall of 2013 to participate in a week-long program at Project Adventure. This program was designed to offer two tiers of learning; one as a participant and the other as a leader of an adventure program. The networking and conversation that took place gave me valuable information to bring back so that I could design group programs at Utah Olympic Park. While at Project Adventure, I immersed myself as a participant and experienced individual growth as part of a large group. I set goals for myself and was able to determine my own level of challenge. This provided an opportunity for personal introspection. Being a participant prepared me for the next level of training which was transferring what I had learned and reflected upon to my role in developing my own programs. Significant – It has meaning and relevance for the participants. Challenging – It involves new experiences encouraging creative, “out of the box” thinking. Supportive – It emphasizes teamwork to develop trust and healthy risk taking. Satisfying – It builds on successes to create greater successes. Fun – It capitalizes on the inherent joy of learning while laughing. I learned that adventure was a way of doing something in an engaged manner and that it includes risk of failure and opportunity for success. 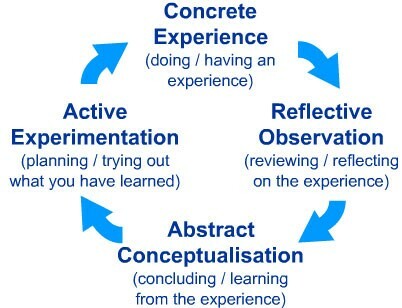 During my program at Project Adventure, I learned about the Experiential Learning Cycle based on David Kolb’s theory that learning happens best in a four stage process. One can enter during any of the four cycles of the learning experience. (see below diagram). We were provided concrete experiences with activities and adventures to explore. Then, we analyzed and reflected on what happened to gain a deeper understanding. I realized how important reflection is in gaining new insight and knowledge. In addition to Kolb’s concept, I studied other concepts. The Adventure Wave was a way to describe the flow of an activity where the start of the Wave was the framing of an activity, which provided the details about it. The doing of the activity at the top of the wave is participation in the experience and the end of the wave is the reflecting period. This model simply shows the importance of the frame, do and reflect cycles. The Project Adventure Program focused on goal setting using the SMART acronym. I learned six types of activities while at Project Adventure which were ice breaker and acquaintance activities, de-inhibitizer and energizer activities, communication activities, trust activities, decision making and problem solving activities, and closure and transfer activities. Ice breaker and acquaintance activities help get members of a group to get to know each other. We started our week with some fun “games” where we learned each other’s names and where we were from. De-inhibitizer and energizer activities are designed to get participants fired up to be willing to take some risks. We played out in a large field where we became comfortable taking physical risks, as well as some emotional risks. Communication activities foster group members being able to share their feelings, thoughts and behaviors in a way that encourages listening skills. We engaged in some activities that involved a group member being blindfolded and having to follow the direction of other team members. Trust activities are designed to develop physical and emotional safety with others. Yes, we did the infamous “trust fall” where you stand on a platform and free fall backward into the arms of your teammates. Decision making and problem solving activities create opportunities for team members to cooperate and communicate in making decisions. I participated in high ropes course initiatives which involved a large degree of communication with my teammate who was belaying me. Closure and transference activities provide an opportunity to reflect on your experience and how you can apply it. We spent half of a day engaging in activities at the end of our program where we focused on reflection. I found that this took everything I learned that week and gave it deeper meaning. I heard about the stages of group development, forming, storming, norming, performing and separation, for the first time at Project Adventure. Since then, I come across it fairly regularly including an entire segment on it last semester in my Building Effective Teams class and my Organizational Behavior and Leadership class. Our group definitely went through all stages of the group development model. I was able to identify each of them as we navigated through the stages. Forming was when we got to know each other. I saw the storming stage when there were small conflicts as we tried to plan our activities together. Once we were able to resolve these conflicts we entered into the norming stage where everything mellowed out which launched us into the performing stage where all the progress and productivity took place. At the end of the week, we experienced the separation stage. Spending a week together engaging in intense activity together made this last stage difficult in saying good-bye to class mates from all around the world. I left Project Adventure with an entire arsenal of tools and activities to start to build team building programs. In addition, I experienced personal growth and acquired skills that benefit all areas of my life. A few months after my experience at Project Adventure, I attended an Association of Challenge Course Technology conference in Palm Desert, California. While I participated in facilitation and programming sessions such as “Awesome Ice Breakers and Energizers”, “Using Impactful Debrief Cards”, “Old Games, New Initiatives”, and “Creativity Boot Camp”, I got the most out of a session called “Meaningful Reflection Brings Learning to Life,” with Jennifer Stanchfield. With my second exposure to Experiential Learning, I was becoming very familiar with the philosophies and methodologies behind the concept. Stanchfield taught the philosophies of John Dewey which is based on the learner participating rather than receiving the information. This belief is that more can be learned when one struggles for a solution rather than provided the answer. Dewey also focused on the fact that learners thrive when they are in an environment where they feel valued, respected and supported. Returning with a more profound understanding of experiential learning contributed to my team building program efforts as well as to my personal life. I started with my Utah Olympic Park team in formulating a plan to launch our new programs. We marketed and suggested our team building programs to those that inquired. Our Basecamp area was ready for action in the spring of 2014. Based on information such as group size, goals, timeframe and budget, I designed custom programs to be facilitated by our guides. I was the lead facilitator for our first ten programs. This gave me the opportunity to make any necessary adjustments. Some of our first groups were Whole Foods employees, Hilton Corporation, Pabst Blue Ribbon and Comcast. I learned a lot about the team dynamics of groups during my hands on facilitation of the programs. I was able to take what I had learned in programs and in working with these groups to further refine our programs and create training outlines for our staff. I no longer work in the Group Sales department, but so much of what I was able to take away from my experiences in team building and learning I am able to apply daily in my life especially when it comes to leading my teams at work.